4S lipos use 4 cells in serial and therefore reach a nominal voltage of 14.8V. If you increase the battery voltage by 33% (3S to 4S) then you are effectively increasing the motor speed by 33%. To keep all things equal you need to decrease the prop size to match this increased motor speed and prevent the motors from heating up. Once at the same wattage (roughly the same speed and thrust in flight) you would draw 33% less current, and therefore get about 33% longer flying time. The reasoning behind that is: Watts = Volts x Amps. Thus increase volts by 33%, then drop amps x 33% for same watts. If you don’t decrease the prop size, the faster spinning prop will generate a lot more speed and a lot more current, increasing the watts very significantly. The resulting effect will be a higher powered (lower hover throttle) quad, with a higher current draw (resulting in shorter flight times). You may also run the risk of overheating your motors or drawing more current than the ESC can handle. This is obviously not desired. Although we do want to increase the power slightly vs. the 3S config. 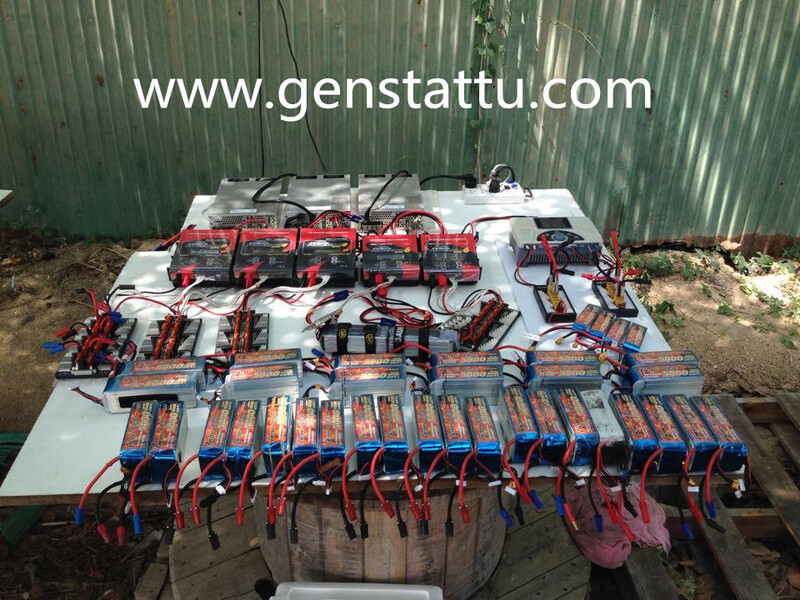 Also keep in mind that not all equipment can handle the higher voltage of Gens ace 2s lipo batteries. The Tarot Gimbal cannot handle this voltage and therefore needs a voltage regulator. If you are using additional FPV equipment, you also need to check if they can handle the maximum 16.8V that 4S brings. Gens Ace 3000mAh 4S1P 20C from Genstattu. This battery is very cheap and delivers roughly as much wattage as a lipo battery 5000mah. It fits the IRIS battery bay perfectly and already comes with an XT-60 plug. I already own a IMAX B6-AC Charger/Discharger, which is capable of charging these batteries without any issues. APC SlowFly 9×4.7 Pusher and Puller propellers. They are basically the same propeller as the stock propellers that come with IRIS, except that they are 9″ in outer diameter instead of 10″. As they use the same spacer rings for the propeller shaft, you can even leave your current ones on IRIS. Voltage regulator from 4S (16.8V) to 12V. The Tarot Brushless Gimbal is recommended to be operated with 12V and cannot handle voltages higher than 14.8V. We therefore need to place a voltage regular between the 4S battery and the Gimbal. This will reduce the voltage from up to 16.8V on the lipo side to 12V for the Gimbal. As the Gimbal only draws a maximum of 500 mA, the linked voltage regular is a perfect choice. Also the regulator already comes with the right plugs, is very small and lightweight.